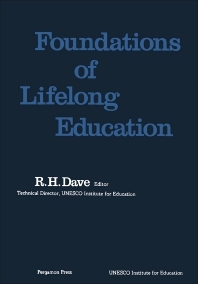 Foundations of Lifelong Education deals with the interdisciplinary foundations of lifelong education and examines a number of basic issues concerning lifelong education, such as why education should be treated as a lifelong process, or how the functions of lifelong education are related to historical and contemporary developments in society. The goals, contents, and processes of learning appropriate to the aspirations of lifelong education are also explored, as well as the extent to which lifelong education is feasible and practicable in different socio-economic and ideological conditions. Comprised of eight chapters, this book begins with an overview of methodological considerations in the present study, such as the nature of the foundations content; general steps that may be followed for constructing discipline-based foundations; and the ways of incorporating several elements of interdisciplinarity into the study. The reader is then introduced to the sociological and philosophical aspects of lifelong education, along with the historical background on the concept of lifelong education. In addition to sociology and philosophy, lifelong education in relation to anthropology, ecology, psychology, and economics is also analyzed. The book concludes by presenting illustrative analyses and syntheses of the ideas discussed in the preceding chapters based on selected disciplines. This monograph is intended for educators, social reformers, and educational policymakers. 5.1 Change as a Psychological "Threat"
6.1 Can Schools Develop Lifelong Learners?